Jonathan Swift, born 30 November 1667, has from his own time to today been celebrated not only for his genius as a writer but also for his generosity and care for the poor. During his lifetime, Swift’s birthday was celebrated in Dublin with the ringing of bells and bonfires. 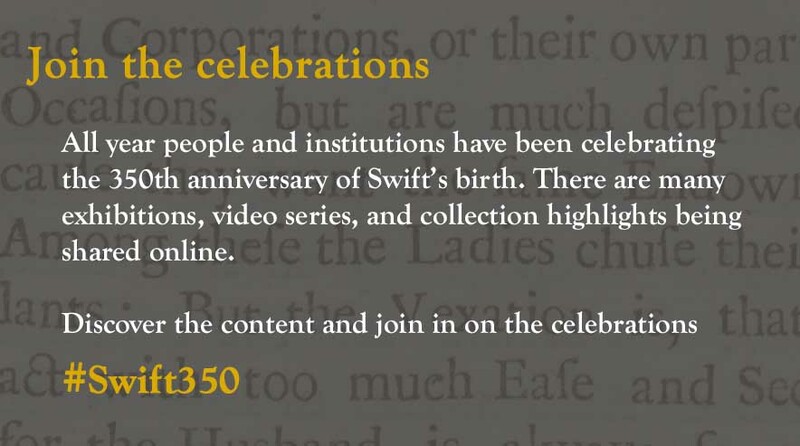 Now, on the 350th anniversary of his birth, Monash University Library remembers Jonathan Swift and pays tribute to him and his continued influence on the Library, the research community and the literary world. Soon after Monash University opened in 1961, the first major purchase for the Rare Books Collection was David Woolley’s collection of Swift’s works, which was mostly comprised of first and early editions. Woolley was an Australian collector and amateur scholar who edited Swift’s correspondence (1999-2005). He is remembered worldwide for his enthusiasm for Swift and his generous gifts to scholars and institutions. Over the years, Monash Library has continued to develop the Swift Collection. We hold all of the early editions of Gulliver’s Travels and A Tale of a Tub, many of his published works in early editions, including the 1696 poem, ‘Ode to the Athenian Society’, as well as some manuscript Swift letters and a pamphlet annotated by Swift. 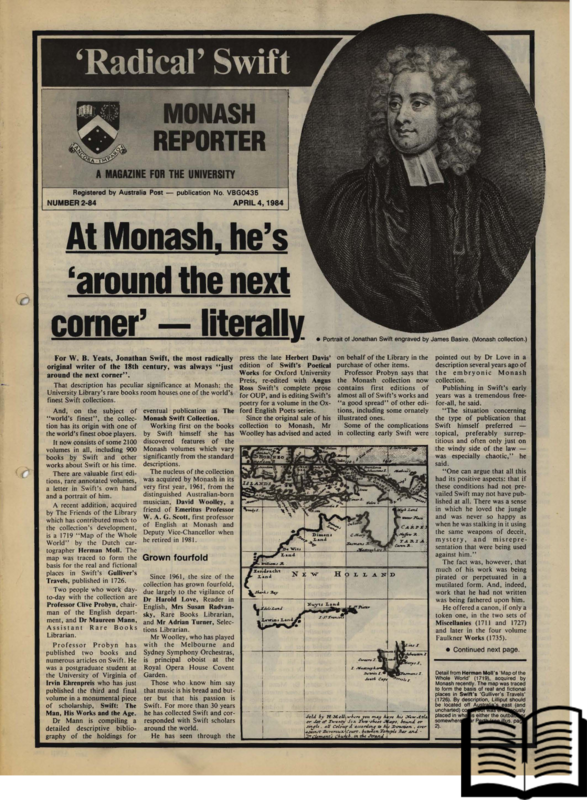 The Library's Swift Collection has long been considered an important resource for the research community, as reported in a 1984 issue of the Monash Reporter, in which several articles were written highlighting the importance of the collection and key items within. Those key items have now been digitised and made available for the wider public through the Library's repository for Special Collections, Monash Collections Online, as well as being featured in this exhibition. 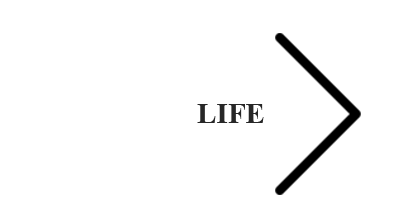 Swift’s legacy and significance to the Library can also been seen throughout the newly renovated Sir Louis Matheson Library, the home of the Rare Books Collection. Text from the first edition of Gulliver’s Travels have been used throughout the Library to incorporate the riches of the collection into the fabric of the building. Whilst the new cafe within the library is called Swift’s. Visitors can also see several of Swift’s works and images relating to his work featured prominently in the recent exhibition Tall Tales and True: Journeys Real and Imagined. In an opening speech for the Library’s most recent Rare Books exhibition Tall Tales and True, former University Librarian Cathrine Harboe-Ree remarked 'Little could Swift have known that, almost three hundred years after Gulliver’s Travels was written, a splendid collection of works by and about him would have pride of place in a 50-year-old university located in the section of southeast New Holland not yet mapped by Moll'. One of the treasures in the Monash collection is the New and Correct Map of the Whole World by cartographer Herman Moll, working in London. This map was traced to form the basis for the real and fictional places in Swift's Gulliver's Travels. Herman Moll published this map seven years before the Travels appeared in print. It shows Antarctica as ‘parts unknown’ and only the west coast of Australia in any detail. Part 4 of Gulliver’s Travels was set in these unknown lands. Both Moll and Swift were known to frequent Jonathan’s Coffee House in Cornhill. One can imagine the two discussing each other’s work and Swift basing his geography on this map.